A man’s hair and beard are dearer to him than he would have you believe and so cutting them can be a daunting process – especially when there seems to be one too many barber in Cairo that insists on put their own spin things. 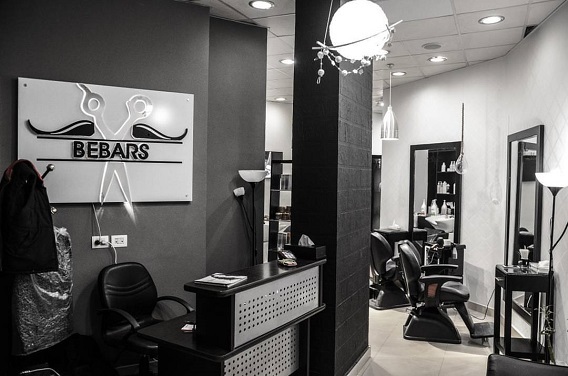 Enter Bebars, located in a side-street near Mosaddak Street. The barbershop has amassed a following on social media, with more than twenty thousand likes on Facebook and three thousand on Instagram, which is quite an achievement by a small barber in Dokki. The L-shaped venue has four seats for haircuts and two for washing and facials. With a contrasting black and white set-up, the sapce has a mostly relaxing feel to it. After taking a seat we were asked about any hair products we preferred or used, as well as if there were any styles we preferred. After having our hair washed and shampooed of any existing products, we took our seat and started the haircutting process. The sides were shorted but not too short as per our request, while the top was gradually shorted with the longest in the front and the shortest at the back, making for smooth grade. Then the barber moved onto the beard giving an equally pleasing fade that matched the sideburns and faded into the longer, bushier jaw-line. As for the neck it was completely shaven off using an electric shaver instead of a razor-blade which was a nice touch for people with sensitive skin. We went back to the washing seat to get any excess hair washed off and then back for the styling process. After towelling our hair, the sides were brushed downwards while the top was combed to the side. After adding some hair wax and some hair spray to keep it into position, we were given the side parted look with short sides that fade into the beard and a nice medium top that slides backwards and to the side. Although 130LE for a haircut and a shave might seem a bit steep compared to other local barbers, overall we had a positive experience with our barber Milad, who happens to be the owner as well. Although after we left we found parts of the beard that still needed trimming, he listened intently to our requests when we wanted parts to be shortened a bit more, for example, and made us feel completely comfortable during the whole, scary process. Ask for Milad the owner - he's great with hair and an awesome dude to boot. High end hair products are used in a no-nonsense set-up. Is it pricey? Maybe, for some, but then can you really put a price on your hair and beard?